Vous souhaitez poser une question à l'établissement Med Room Korat ? Niché en plein Nakhonratchasima centre, Med Room Korat est idéal pour partir à la découverte de Nakhon Ratchasima. Le centre-ville est à seulement 6 km et aller à l'aéroport ne prend que 46 minutes. Grâce à son excellente situation, l'hôtel permet de facilement se rendre sur les sites incontournables de la ville. Profitez d'une profusion de services et d'équipements hors pair dans cet hôtel de Nakhon Ratchasima. Pour le confort de ses clients, cet hôtel propose WiFi gratuit dans toutes les chambres, WiFi dans les espaces communs, parking, restaurant, blanchisserie. De plus, la plupart des chambres disposent d'une gamme d'équipements tels que télévision écran plat, accès internet (sans fil), internet sans fil (gratuit), climatisation, chauffage qui satisferont même les clients les plus exigeants. Que vous soyez un accro de la gym ou que vous souhaitiez simplement vous détendre après une longue journée, vous pourrez profiter de superbes équipements de loisirs tels que aire de jeux pour enfants, jardin. De superbes équipements et un excellent emplacement font du Med Room Korat le camp de base idéal lors d'un séjour à Nakhon Ratchasima. Location is isolated, a bit difficult to find. Not suitable for traveler without car. Rooms were well equipped and very clean. Breakfast was lovely and delicious. The hotel is 4 years old yet well maintained. I think they use 1,200 thread count linen so feels right at home! Only setback is the surrounding and the entrance from main street which would not be ideal for overseas travelers with no cars. As for us, we will definitely return anytime we visit Korat! I am an American but I have lived in BBK for over three years. I was surprised and blown away by this beautiful, Mimi resort. It has 12 single story bungalow/ rooms in a very nice court yard setting. The design and furniture were top notch and near new. Nice shower and restroom. Nice bedding harder but tall bed. But not the traditional rock h as rd Thai pad. The room was large and even had a back patio. The coffee shop had yummy treats and drinks, with first class service by Jeab. They gave us room service with a smile. Jeab also helped me find a restaurant down the road. They were closed at that time. I was there on Songkarn festival. The room and the landscape was so nice I wish I could llive there. Good news bad news. It is off the beaten path. So no traffic, no noise, very relaxing. If you have transportation it's perfect. I had to walk 1000 meters to find a restaurant open. There were some mom & pop shops selling drinks & chips. But it was festival time too. All in all I will return every time I go to Korat. One trick I do is get the cell phone number of the taxi or TuTu driver who drops you off. Tip him and ask if he could pick you up when you depart. Excellent stay, large rooms, clean, everything is new, great modern design all around the property, location is a bit outside the city, but perfect for those who drive further and only stop for a night. Friendly and helpful staff, I will come back. Although location is a bit far from city but overall is really satisfied and perfect. will surely back to stay at this hotel. Rooms are big, nice, everything looks new and stylish! If I come back to Krat- I will stay only here! First of all, it is extremely difficult to find. It is not in the city center at all, and even with the address in Thai, the taxi driver couldn't find it, and the number provided by Agoda is wrong. Also, no one working at the hotel with the exception of one cleaning lady really had any knowledge of English. There didn't seem to be anybody in charge working there at all, just cooks and cleaning ladies. There is a songtaew that will take you to the hotel but we only learned that after we arrived. The hotel might have told us that when we booked on Agoda. Also, there is a cafe, but it doesn't seem to stay open much past 6 pm, making it rather useless. There is no choice for breakfast, just fried eggs (with meat...vegetarians beware) and strange toast with frosting. The internet never worked reliably. It was slow when it did connect and often didn't connect at all. The room itself is huge with a great bed, flat screen TV (but no English channels) and a desk. The room is set up to be like a private bungalow, which is also a nice touch. And of course, it is rather cheap. However, the faucet to our sink didn't work and consistently flooded the bathroom. I would have gladly paid more for better customer service (with SOME English, no need to be fluent), better WiFi, better food, and better location. This is a great place if you speak Thai and have your own car. Once here, you cannot walk anywhere, not even so much as a convenient store is nearby to get a beer or water. I will say that although it was very difficult, the staff were helpful (except for the night watchman) even though they don't speak English. One of them eventually understood where we wanted to go in town and offered to drive us there. 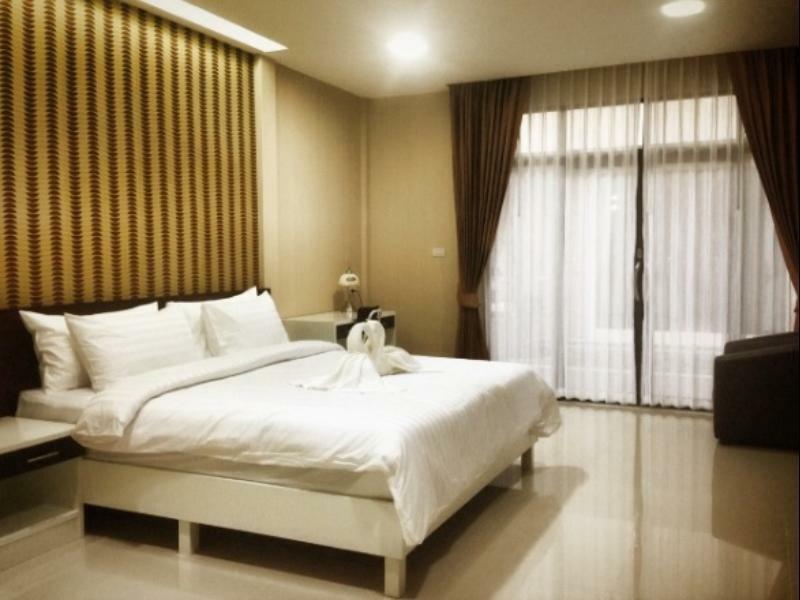 This hotel isn't located in any convenient way whatsoever to anything a tourist might want to do or see in Korat, and it is especially far from the downtown night market. The positive reviews from foreign travelers on Agoda seriously misled us. Only stayed for one night but very nice comfortable hotel. Whilst breakfast was good there was no choice so could be boring if staying longer. Whilst it is hidden down some small back roads we were able to find it with ease due to detailed directions by the hotel manager.